This is a chapter heading from a work in progress called Light in Dark Times written by anthropologist Alisse Waterston. In each chapter we meet different philosophers, historians and anthropologists whose writings help illuminate a way forward in dark and uncertain times. On this page we meet Peg Birmingham (portrait bottom right) who is surfing with Hannah Arendt, Alisse Waterston and I are the characters who are falling in mid-air. We hope to have the book out on shelves by October 2019. 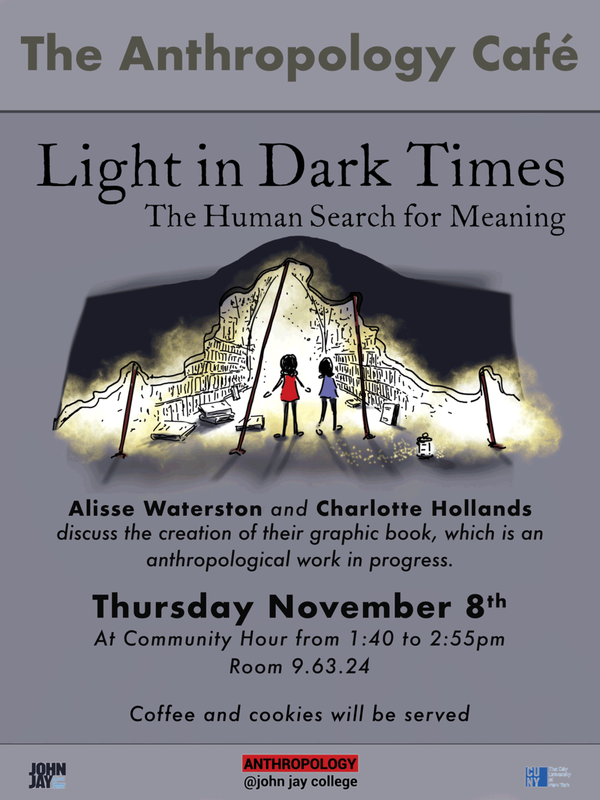 Alisse and I have already given a few sneak-peaks to some anthropology students, the poster shows another drawing from the book.